The U.S. 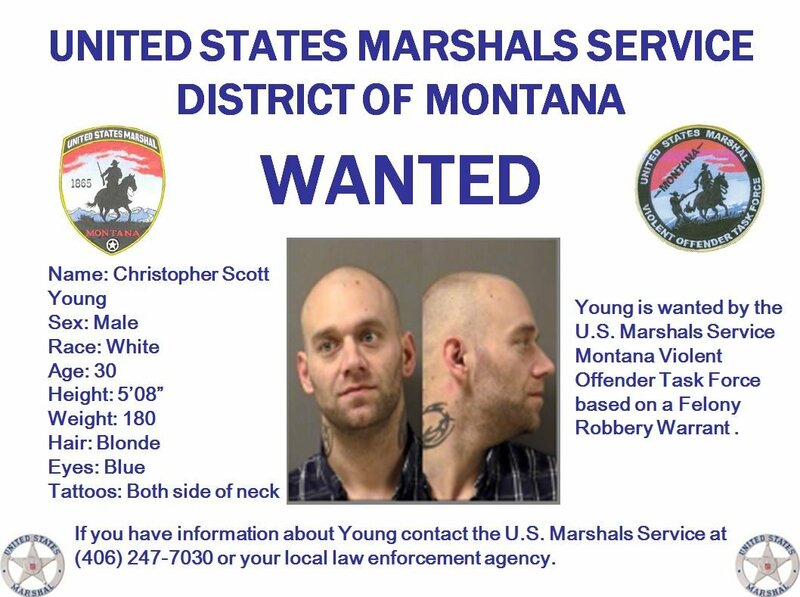 Marshals Service District of Montana has issued a BOLO Alert (Be On the Look-Out) for Christopher Scott Young. The warrant was issued by authorities in Billings. Young is the second suspect allegedly involved in a purse-snatching in June that injured an elderly woman and a Good Samaritan who came to the woman’s aid. The other suspect, Zachary Tucker Martin, has been charged with felony counts of robbery, assault with a weapon, and criminal mischief. He was also charged with two misdemeanor counts of theft. Young is 30 years old, 5-feet, 8-inches tall, 180 pounds, with blonde hair and blue eyes. He has tattoos on both sides of his neck. Anyone with information about Scott is asked to call the U.S. Marshals Service at 406-247-7030 or your local law enforcement agency.